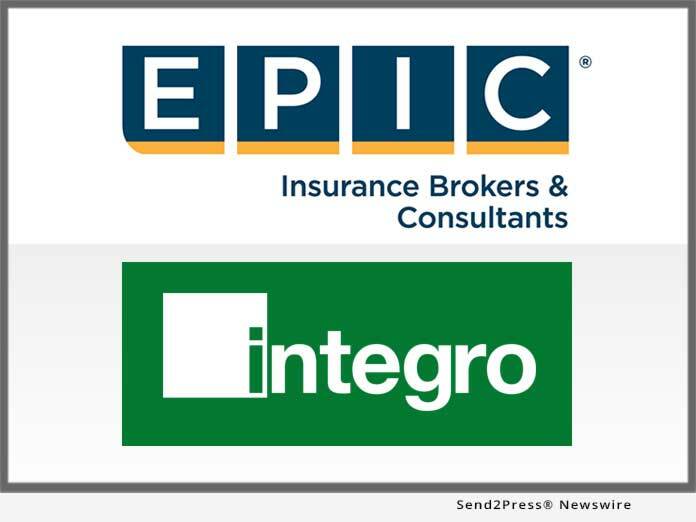 SAN FRANCISCO, Calif., Feb 04, 2019 (SEND2PRESS NEWSWIRE) -- EPIC Holdings, Inc. today announced the closing of EPIC's acquisition of Integro Holdings Inc. (substantially all of the U.S. operations of Integro Group Holdings). Please see our press release issued on December 17, 2018 that follows for more details and comments on the transaction. SAN FRANCISCO and NEW YORK, Dec. 17, 2018 -- EPIC Holdings, Inc. today announced an agreement to acquire Integro Holdings Inc., which houses substantially all of the U.S. operations of Integro Group Holdings, LP. Founded in 2005, Integro has built a highly successful specialty insurance brokerage and consulting business in the U.S. with revenue in excess of $150 million. Financial terms of the proposed transaction have not been disclosed. Integro USA brings to EPIC expertise that is well aligned with EPIC's diverse insurance distribution platform. Entertainment & Sports: focus in music & events; theatre & venues; film, TV & media; sports associations & amateur sports; and racing & motor sport. Specialty: leading provider of insurance brokerage services to Professional Services Firms (accountants, lawyers, hedge funds, asset managers, architects & engineers) and Transportation & Logistics businesses. Risk Management/Complex Accounts: deep technical services for the Fortune 500 and complex risk accounts. Employee Benefits Consulting: expertise for mid to large employer groups as well as unique services for the private equity sector. Integro USA is led by Marc Kunney, President of North America Operations. The acquisition will add over 400 team members working across 22 US locations. Kunney commented on the transaction, "Joining forces with EPIC allows us to continue offering our clients the highest level of service and expertise, while providing depth and scale to further invest in our combined capabilities." Pete Garvey, EPIC Insurance Brokers & Consultants CEO and a founder and former CEO of Integro Ltd., noted, "I know firsthand what a high quality group Integro is. We can't be more delighted to have their U.S. team join forces with EPIC." Steve Denton, President of EPIC Holdings Inc. added, "EPIC and Integro USA fit together perfectly with common themes including a passion for client service and delivering specialty capabilities supported by actionable analytics." The transaction is expected to close in January 2019. The financial advisor for EPIC was Rob Giammarco at Bank of America Merrill Lynch and their legal advisor was Chris Machera at Weil, Gotshal & Manges, LLP. The financial advisor for Integro was Stuart Britton at Evercore and their legal advisor was Paul Kukish at Latham & Watkins, LLP. EPIC Holdings, Inc. is the corporate parent overseeing investments across the entire EPIC platform. EPIC currently has nearly 1,400 team members operating from 50 offices across the U.S. and annual revenues over $440 million. EPIC has created a values-based, client-focused culture that attracts and retains top talent, fosters employee satisfaction and loyalty and sustains a high level of customer service excellence. EPIC team members have consistently recognized their company as a "Best Place to Work" in multiple regions and as a "Best Place to Work in the Insurance Industry" nationally. Backed by Oak Hill Capital Partners, the company continues to expand organically and through strategic acquisitions across the country. Launched in 2005, Integro is among the nation's largest and most respected insurance brokerage and risk management firm. Clients credit Integro's superior technical abilities and creative, collaborative work style for securing superior program results and pricing. The firm's acknowledged capabilities in brokerage, risk analytics and claims are rewriting industry standards for service and quality. The firm's U.S. headquarter office is located at 1 State Street Plaza, 8th Floor, New York, NY 10004. 1-877-688-8701. For additional information, please visit: https://www.integrogroup.com/. Business, California Business, EPIC Holdings, EPIC Insurance Brokers and Consultants, Finance, Insurance, Integro Holdings Inc, Mergers and Acquisitions, Oak Hill Capital Partners, San Francisco Business, SAN FRANCISCO, Calif.